Okaihau Pastoral Ltd managers Joe and Jenima Foster. A top Northland dairy farm - Okaihau Pastoral Ltd - will open its gates for peer review with a "regional optimisation day" on October 25. The farm, in Wehirua Rd at Okaihau, was runner-up in this year's Dairy Business of the Year awards with its managers, Joe and Jenima Foster, winning the Best Northland Farm Performance Award for the second year running and picking up the award for High Input Farm with the Best Financial Performance. The 2017 Dairy Business of the Year title went to Sulzburger Farms Ltd in Taranaki, but those who attend the Okaihau Pastoral field day next month will be able to marvel at the Fosters' success in a region they consider an undiscovered gem for dairying. Dairy Business of the Year (DBOY) judge Con Williams said the Fosters winning the Best Northland Farm Performance Award for the second year in a row highlighted their ability to adapt to a challenging operating environment. Despite high rainfall, Okaihau Pastoral achieved production of 1645kg/ha - high for Northland and the second highest of all finalists - despite a significant drought during the 2015-16 season on which the DBOY awards were based. The use of supplementary feed and concentrates was a key factor for the Fosters. Pasture consumed at Okaihau was the second-lowest of all finalists at 61.6 per cent. A high proportion of home-grown forage helped keep the cost of consumed feed low at $292tn/DM. Williams said: "This highlights one of the golden rules of a more intensive system is to focus on cost control and maximising the return from investment into supplements. "This includes focusing not just on the purchase or growing price of the supplement, but also the costs associated with feeding it and the leftover wastage." Joe Foster said they owed a lot of success to their consultant Paul Martin from Intelact. In the 2015-16 season Okaihau Pastoral milked 1056 cows producing 527kgMS/cow and 1645kgMS/ha. Cost of production was $3.71kgMS ($4.26 operating expenses/kgMS) and operating profit $420/ha (revenue $8422, expenses $7003). Joe Foster grew up in Whangarei and Jenima moved north as a child when her parents bought a lifestyle block in Whangarei. The pair met in 1994 while both worked for the Department of Conservation. They have three children - Brad, 21, who is now 2IC on the Okaihau farm, Kurtis, 18, and Lauren, 15. 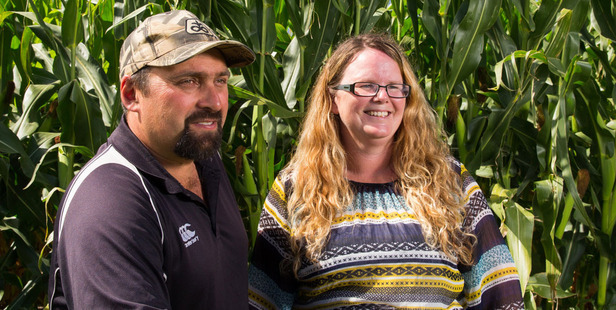 Joe and Jenima decided to move from DoC to dairying and spent 10 years farming in Northland, the Central North Island and Hawke's Bay before starting at Okaihau Pastoral in the 2013 season, when the farm produced 347,000kg/MS. In their first season production increased to 449,000kgMS, rising to 580,000kgMS in 2016-17. They have a 600,000kgMS target from 1150 cows this year, with production now already 20 per cent ahead of last year. Okaihau Pastoral is an equity partnership with 15 shareholders. The Fosters became shareholders this season. The other shareholders, ranging from accountants, contractors and sheep and beef farmers from all over New Zealand, make an inspection visit to the farm once a year. Six fulltime staff help Joe and Jenima operate the farm, where cows are fed a mixture of grass, maize and chicory. Palm kernel is fed throughout the season along with waste fruit from Kerikeri orchards. About 36ha of chicory is grown on the farm and 80ha of maize is grown on a nearby dairy support block. Up to 23 tonnes of DM/ha is expected to be harvested, but that depends on the weather. Two 500-cow covered feedpads shelter the herd during wet winter weather and provide shade in hot summers. Twin weeping wall systems collect all feedpad effluent and extracted solids are used to fertilise crops. Winter milking takes advantage of the premium. About 300 cows calve during autumn and the rest in spring. Jenima and her daughter-in-law Arlene raise the calves, which are weaned at 100kg with some remaining on the farm.